The most used kitchen appliance in my house, next to the stove, is the waffle iron. My roommate loves to mass make waffle batter, store it in a container in the fridge and have fresh waffles every morning. 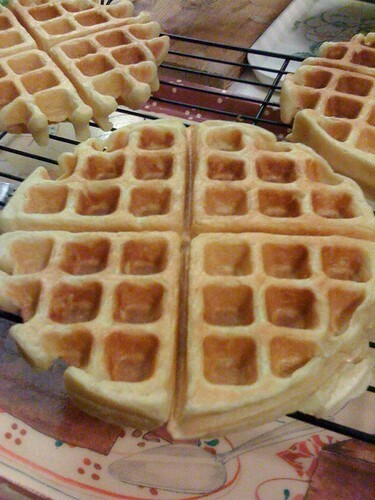 Over Christmas, I made buttermilk waffles twice from Cook’s Illustrated “The Best Buttermilk Waffles” recipe. I prefer to make waffles ahead of time and then pop them in the toaster for an extra crispy exterior the morning I eat them. My favorite Indian dish is tikka masala because I love rich, creamy foods that have a hint of spice. When I moved to San Francisco, the Costco’s in the area started carrying Maya Kaimal Indian sauces, which included a quart of tikka masala. Most recently, they renamed it to butter masala. Still the same sauce though. The tikka masala is very easy to prepare – start some rice in the rice cooker, boil some potatoes until they are soft, lightly sautee some chicken until it is half cooked, pour in the tikka masala sauce and simmer for 10-15 minutes until the chicken is cooked through and the sauce is thicker. I used baby russet potatoes which have a soft, creamy texture that mixes well with the chicken and rice. A quick meal after work! The leek potato soup was surprisingly flavorful despite having only 3 base ingredients: leeks, potatoes and vegetable broth. Shitake mushroom pizza used fresh shitake mushrooms from the Ferry Building Farmer’s Market ($4 for a box), Trader Joe’s pizza dough that I bought a few months ago and had in the freezer, generous amounts of mozzarella because my friend loves cheese, the perfect amount of tomato sauce.